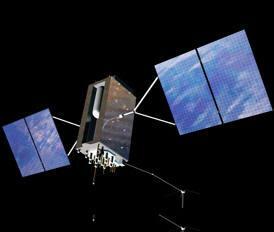 August 22, 2010 - The Lockheed Martin team developing the U.S. Air Force’s next generation Global Positioning System, known as GPS III, has successfully completed the program’s Critical Design Review (CDR) phase two months ahead of the baseline schedule. CDR completion, the program’s most significant milestone to-date, validates the detailed GPS III design to ensure it meets warfighter and civil requirements, and allows the program to begin the production phase. More than 350 representatives from the U.S. Air Force Global Positioning Systems Wing, the GPS III contractor team, as well as user communities from the Department of Defense, Air Force Space Command, the Department of Transportation and the Federal Aviation Administration participated in a four-day Space Vehicle CDR at Lockheed Martin Space Systems Company’s new Patriot Center in Newtown, Pa. Completion of the CDR phase represents the culmination of many rigorous assembly, subsystem, element, space vehicle and system level CDR events and validates the overall design maturity of the GPS III Space Vehicle and Lockheed Martin’s readiness to enter production. GPS III will improve position, navigation and timing services and provide advanced anti-jam capabilities yielding superior system security, accuracy and reliability. The next generation GPS IIIA satellites will guarantee signals three times more accurate than current GPS spacecraft and provide three times more power for military users, while also adding a new civil signal (L1C) that is designed to be interoperable with other global navigation satellite systems. The GPS IIIA flexible design will allow for low-risk, reliable and affordable capability insertion for the future GPS IIIB and IIIC spacecraft. “This successful review demonstrated with high confidence that our low-risk GPS III design will meet warfighter and civil user requirements and that we are fully prepared to enter the production phase of this vitally important program,” said Joe Trench, Lockheed Martin's vice president of Navigation Systems. “Working in partnership with the Air Force, we look forward to building on our momentum to achieve our customer's cost, schedule and performance requirements for this essential program." Lockheed Martin, Newtown, Pa., along with teammates ITT of Clifton, N.J., and General Dynamics of Scottsdale, Ariz., is working under a $3 billion Development and Production contract awarded by the Global Positioning Systems Wing of the U.S. Air Force Space and Missile Systems Center, Los Angeles, Calif., which includes production of up to 12 GPS IIIA satellites. The team is on track to launch the first GPS IIIA satellite in 2014. The GPS constellation provides critical situational awareness and precision weapon guidance for the military and supports a wide range of civil, scientific and commercial functions - from air traffic control to navigation systems in cars, cell phones and wristwatches. GPS is increasing productivity in areas as diverse as farming, mining, construction, surveying, package delivery and supply chain management. The system is also enhancing public safety by reducing response times for ambulances, firefighters and other emergency services. Air Force Space Command's 2nd Space Operations Squadron (2SOPS), based at Schriever Air Force Base, Colo., manages and operates the GPS constellation for both civil and military users.